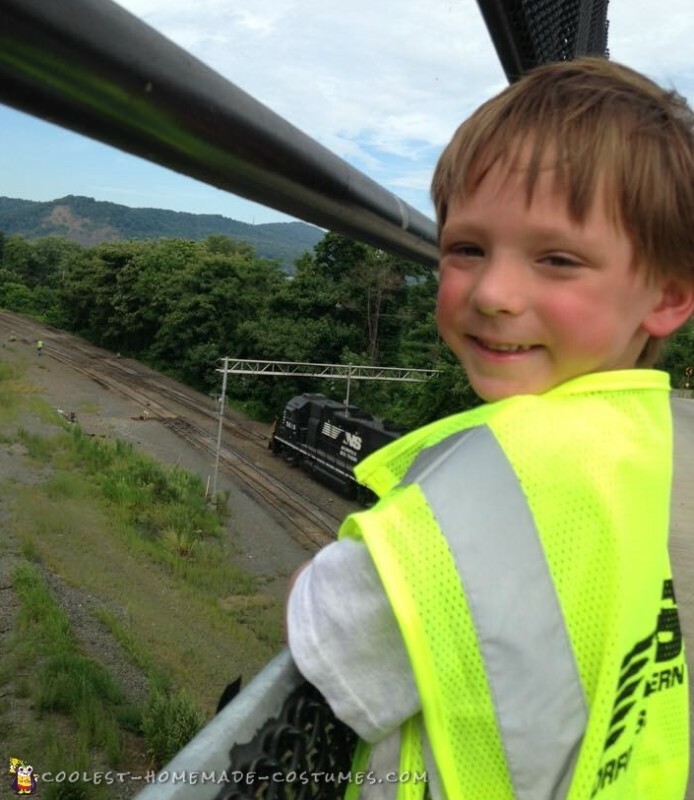 So, our son, Cole, has been in love with trains since he was about two years old. He loves to watch the Norfolk Southern trains pass through. 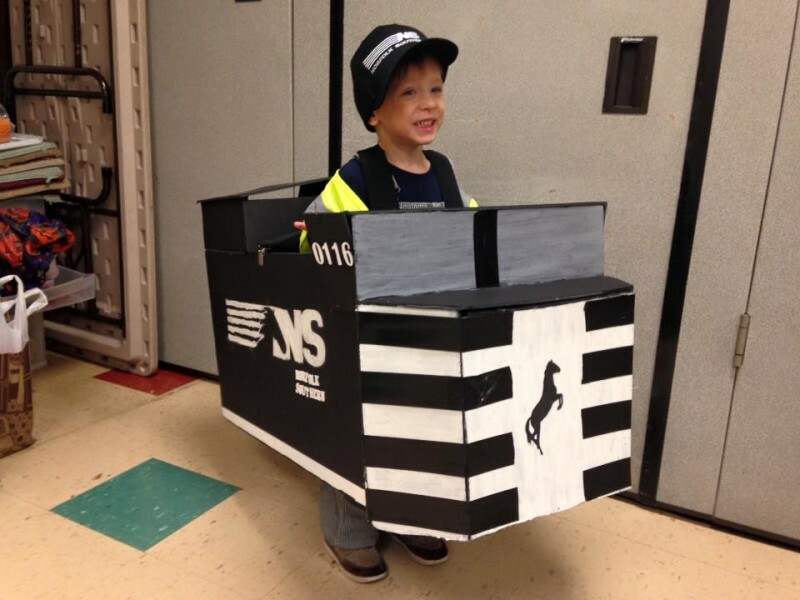 When he was two he said he wanted to be a train for Halloween. If you look on the internet there are tons of ideas for Thomas – but hardly anything for actual freight trains. 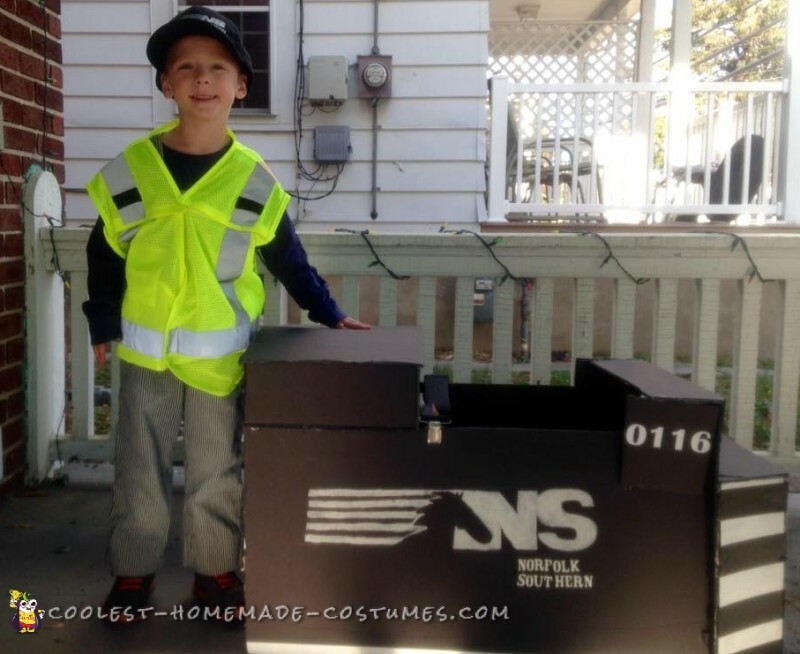 There was not a single Norfolk Southern train costume out there. Our first attempt at a train costume for him was a rushed effort and a cardboard box. He was two, and so it stood the purpose of a Halloween train costume for him. The following Halloween, Cole wanted to be the black train again. This time, we had time to prepare. So, this costume is made out of a foam presentation board. We even bought it in black. The NS logo was made freehand by my sister in law. The stripes in front are white duct tape. In order to make the lettering we used stickers. The straps are suspenders and attach to the inside of the box. We have a friend who works on the train and got him the vest and hat he is wearing. The nice part about the costume being the foam board is it is heavy duty but lightweight. Cole had no trouble walking and holding this costume up on his own. Cole has worn this costume for two Halloweens in a row. Everyone has loved this costume. My sister in law and I made this as a joint effort. Amazingly, it is still is in excellent shape. Cole is 5 now, and he has not lost his love for the NS trains. As Halloween approaches, Cole has been requesting a caboose this year….